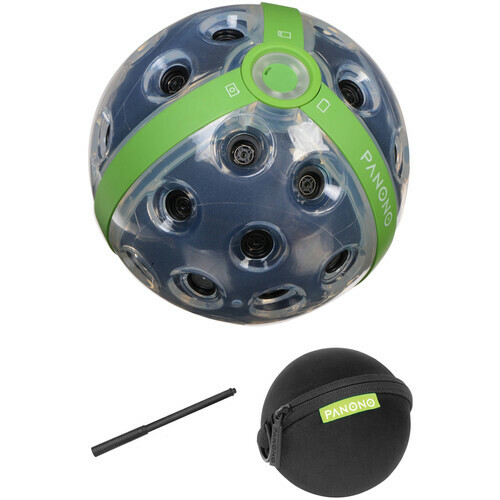 Comprising everything needed for capturing high-resolution panoramic images, the Panono 360° Camera Explorer Edition Kit from B&H bundles the unique spherical camera with a stick for holding the camera, and adapter for attaching it to a tripod, and a case for protecting it when not in use. Use the Panono Stick to take overhead photos with your Panono camera without throwing it in the air. Simply screw the camera on and use the built-in shutter button to trigger the camera and take a photo. When you're not shooting with your Panono camera, zip it up inside this Case for protection against the elements. The spherical shape is molded to the size of the camera, so it won't take up excessive space in your bag. Use the Panono Adapter to place your Panono camera on a standard tripod. Screw the Adapter into your camera and lock your camera onto your tripod. A micro-USB port acts as a passthrough for power when tripod-mounted. Box Dimensions (LxWxH) 18.2 x 2.8 x 2.6"
Box Dimensions (LxWxH) 6.0 x 3.6 x 2.9"
Box Dimensions (LxWxH) 6.6 x 2.7 x 2.5"